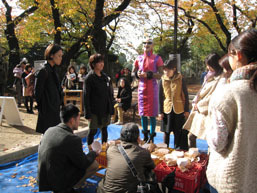 Introducing two participatory autumn events based on the tea ceremony. This is the seventh installment in a series of articles produced collaboratively by the Tokyo Culture Creation Project and Tokyo Art Beat. 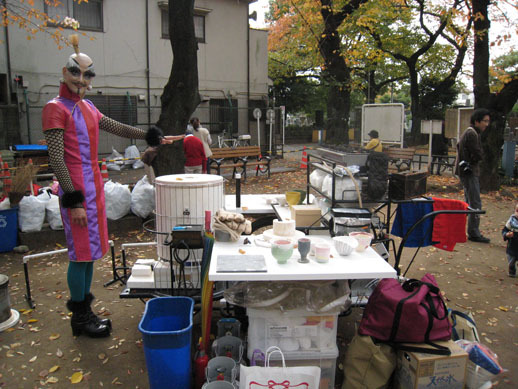 In this piece, TABlog writer Miki Takagi takes a look at the Guru Guru Ya→Mi→ Project that unfolded on the streets of Yanaka, one of Tokyo’s most popular old-fashioned shitamachi (downtown) areas. 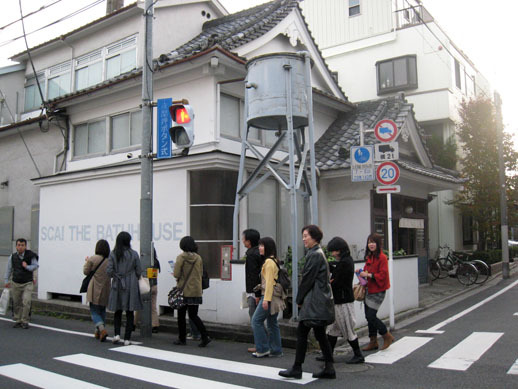 Located in Tokyo’s Taito ward, Yanaka was spared much of the damage inflicted on the Japanese capital during the Great Kanto Earthquake of 1923 and World War II. 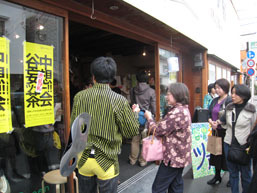 The area has also escaped much of the large-scale redevelopment that has taken place elsewhere in the city, which gives it an old-fashioned vibe — many antique buildings reminiscent of the Edo era still stand today, including quaint folk dwellings that house carefully curated accessory shops and Japanese-style eateries that open only on weekends. Following a stray cat down a narrow alleyway, you are sure to stumble upon a new discovery that stirs your sense of adventure every time. 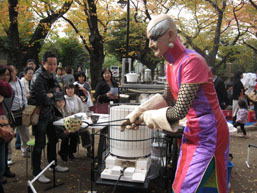 With Tokyo University and the Tokyo University of the Arts located nearby, Yanaka’s artistic and cultural vibe also counts among its many charms. 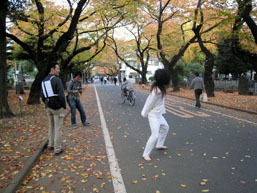 Recently, the area that also encompasses the adjacent neighborhoods of Nezu and Sendagi in Bunkyo ward has come to be known as “Yanesen”: a popular spot where people of all ages can enjoy a leisurely stroll. This tranquil neighborhood was the setting for the Guru Guru Ya→Mi→ Project. “Guru Guru” is an onomatopoeia created by Yanaka no Okatte that refers to the spontaneous, swirling desire to express oneself artistically after being inspired by a neighborhood and its residents. “Ya→Mi”, on the other hand, refers to the group of people who come into contact with this whirlpool of energy, get stirred into action, and help to spread the vibe through various activities and programs held all over town. 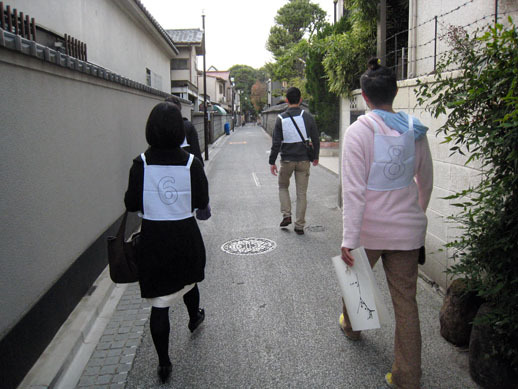 Thanks to the efforts of these “Ya→Mi”, visitors to Yanaka will set off even bigger swirls and become “Ya→Mi” themselves, heading off into some other new territory. This infinite, infectious chain reaction is at the heart of the Guru Guru Ya→Mi Project. This year’s project — the second installment after the first edition kicked off last year — featured two interactive programs based around the concept of the Japanese tea ceremony. 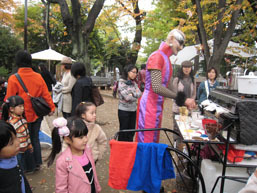 At the children’s play area inside Yanaka Cemetery, Kimuratoshirojinjin conducted an open-air tea ceremony from a mobile cart that he has been using for his performances all throughout Japan. 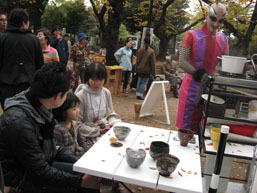 Participants chose their favorite piece from among his handmade collection of unfired ceramic tea bowls and painted them. After these decorations were added, the bowls were fired in a kiln for forty minutes in order to produce utensils for holding the matcha green tea imbibed during the tea ceremony. 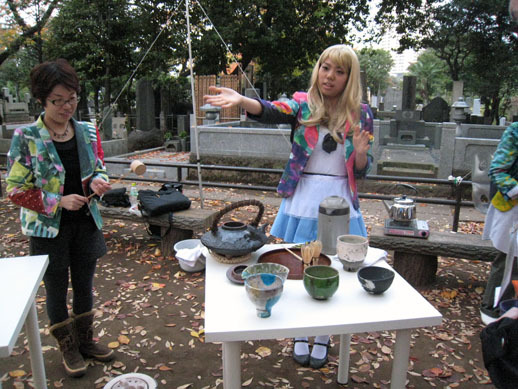 A closer look at how the tea ceremony is conducted: first, the work of painting the tea bowl that you have selected. 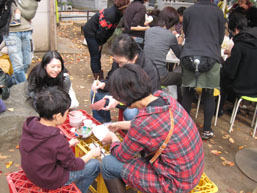 Kids, adults and even elderly folks sat in rapt concentration, applying an enamel glaze onto the surface of their chosen bowl. Staff members patiently explained the finer details to an old man from the neighborhood who had dropped by out of curiosity. Cocking an ear, you realize he’s started telling you stories and anecdotes about the Yanaka area. When you turn around to look at him, he has a blissful smile on his face. 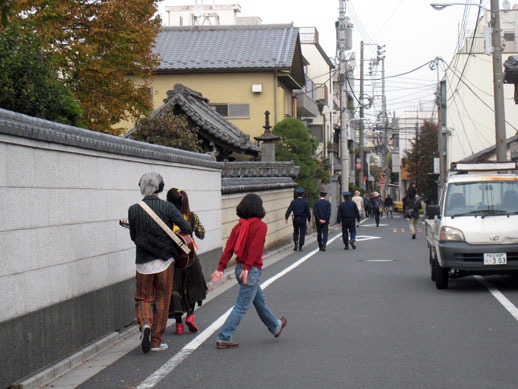 Yanaka is a neighborhood of many small, narrow streets. Even if you’re headed towards a familiar destination, you can always enjoy a change of scenery by taking a few detours and turning new corners. The “Yanaka Delusion Tour!! 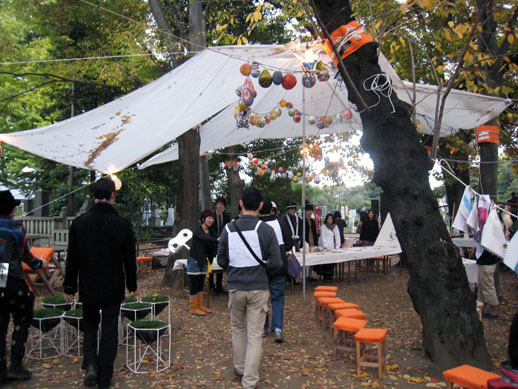 Tea Party” was an event that made the best possible use of the neighborhood’s unique landscape. 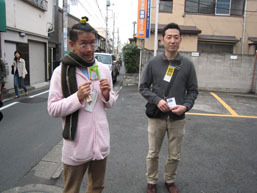 Split into groups of around four people, participants strolled around Yanaka with the help of a map that they had been given, exploring old folk dwellings, abandoned lots, temples and shops while making their way to a number of fixed checkpoints in search of the goal. 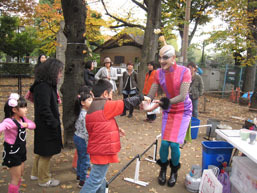 Along the way, they came across a whole host of performances by “geijutsu-ko” (young artists) which, according to the flyers, were meant to entertain and welcome the tour participants. 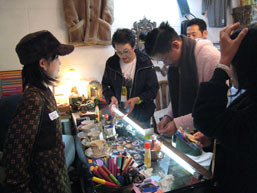 Visitors were assigned and split into groups at the reception area inside the K’s Green Gallery, where staff members explained the logistics of the tour and handed out one map to each group before sending them on their way. 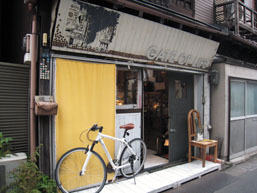 Walking down a street with map in hand, I discover the first checkpoint — an accessory shop called “Gate of Life”. Stepping in and receiving instructions from the staff, we set to work making “coffee lucky charms”. This Delusion Tour features not just performances, but also interactive activities that participants can get involved in. 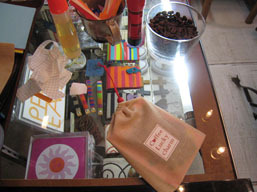 After writing out a wish for a loved one, I stuff the message into a small bag together with some coffee beans and the lucky charm is complete. While we get together to take some photos together with the charms we’ve just made, the staff draw us a map showing us how to get to the next checkpoint. When we arrive at the next destination indicated on the map, there are already four other groups waiting their turn. 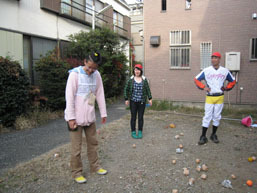 The next activity is that school sports day favorite, the ball-toss. For a brief moment, I get cold feet, seeing a stack of numbered cloth bibs at the bottom of the basket with the team names printed on them. Crossing our fingers and hoping that we’d somehow end up with the most goals, we put on the bibs. All of a sudden, we hear a loud shriek. Heading in the direction of the noise while wondering what on earth it could be, the voice gradually gets closer. Looks like we’ve arrived at the next checkpoint on the map – Daiyuji, a temple whose doors are usually closed to the public. Getting past the gates of a building that you would typically just walk right on by was something of a thrill: I felt as if I’d somehow managed to get one step closer to the heart of Yanaka. It’s not as if I was indulging any romantic notions of the place, though. The next moment, this couple clothed entirely in black started screaming at the top of their lungs. 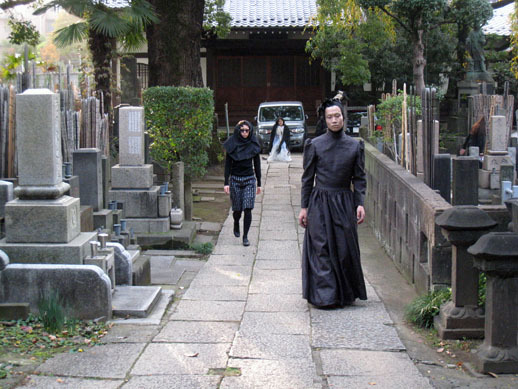 Temples and cemeteries are extremely delicate places. Events and activities that generate too much noise would ordinarily be prohibited, but here was a man and a woman making such a racket that anyone would be curious what all the fuss was about. 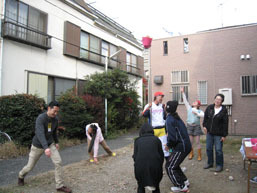 Here was a performance that really helped me understand the art and culture of Yanaka, and the hidden depths of its inner quarters. After clearing another two checkpoints, we finally see our final destination written on the map – the children’s play area inside Yanaka Cemetery. As usual, we have to endure a string of people pointing at our bibs and laughing. When we reach the goal at last, our group is, believe it or not, the first to arrive! At the end of the Delusion Tour, “delusion maps” were given out. Each group was given a different set of checkpoints, so everyone started comparing notes about the places they had been to and the checkpoints they had visited. One way to relive your tour through Yanaka: try to imagine the sorts of performances that were staged during the tour with the map in one hand. Tokyo’s traditional shitamachi downtown areas have been enjoying a renaissance of late. Their mazes of narrow streets, nostalgic atmosphere and warm human touch are not just a welcome reprieve for those exhausted by the noise and clamor of the city and its dizzying pace of change. These areas also welcome new cultural initiatives like this one with openness and generosity. In a neighborhood like Yanaka, which continues to enjoy a particular reputation for art and culture, all eyes are on the lookout for the next “Guru Guru” wave and its flock of cultural “Ya→Mi→” ambassadors to spread those good vibes.